London, 1959, Stella and Toby, both art students, have married and moved into their first home and surround themselves with bohemian friends. Pete Bradley has been a policeman for a year and is dreaming to a move to CID when he finds the body of young prostitute lying near to the River Thames. The case is quickly taken over by the murder squad, but Bradley’s potential is spotted and he soon finds himself working undercover monitoring fascist groups operating in Notting Hill, where a large Irish and Caribbean community is located. Spotting a notorious criminal, he makes what appears to be a significant collar, only for the case to be prized away from him. A few months later and another victim is found not long after Stella experiences another vivid nightmare. As London moves into the swinging 1960s Stella’s career as a fashion designer starts to take off, and Toby becomes a successful artist. However, her nightmares are still occurring, followed by the discovery of another victim of ‘Jack the Stripper’. Pete is now working undercover within the police, but is still obsessed with solving the prostitute murders. Unwittingly, Stella and Pete are working different ends of the same mystery, desperate to stop any more women falling victims. 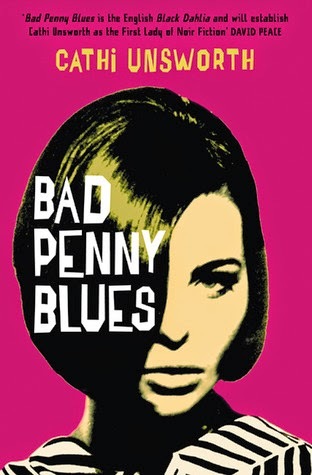 Bad Penny Blues provides an evocative rendering of London in the late 1959s and early 1960s and the criminal and bohemian interface around the north inner city, and the emerging racial tensions. Indeed, the real strength of the story is the creation of a very strong sense of place using music, fashion, and the arts, along with snippets of scandals from the news and thinly veiled references to real-life criminals and the ‘Jack the Stripper’ case, which took place between 1959 and 1965. Cathi Unsworth tells the story by swapping between two narratives, a first person account of Stella, a young fashion designer, and the third person perspective of Pete, a young copper. It was an interesting approach, with the former designed to introduce the bohemian side of the city, and the latter its seedy underbelly and police corruption. However, it took me a little while to connect with Stella and her third sight, and the two parallel narratives created an awful lot of characters and subplots, and at times it become a little confusing to keep track of everyone and what's happening. Either narrative would have been substantive enough on its own. That said, there is sufficient character development in both strands, the story is interesting, and London in the late 1950s and early 1960s is really alive on the page. This sounds very interesting. Not sure I like the idea of Stella's third sight but do like the two parallel narratives. Don't know if I will seek it out soon, but thanks for introducing me to this author. Tracy, I'm also not a fan of third sight plots, esp. when unnecessary, as with this story. What sets the book apart though is its portrayal of London in the period, which is very well done.